Concerns from a group of Bondi business owners about a cycleway at Bondi Junction should not get in the way of its construction. Local paper the Wentworth Courier reported that more than 25 businesses have written letters of objection about the proposed cycleway because they fear the loss of car parks will negatively affect them. “I’m against cycleways because they’re taking up to five car spaces from outside my business," said local shop owner Nikki Hamilton. But of course, we’ve heard this before. What the business owners may not be realising is that car occupancy generally is low and that bike facilities mean more people can access retail areas. 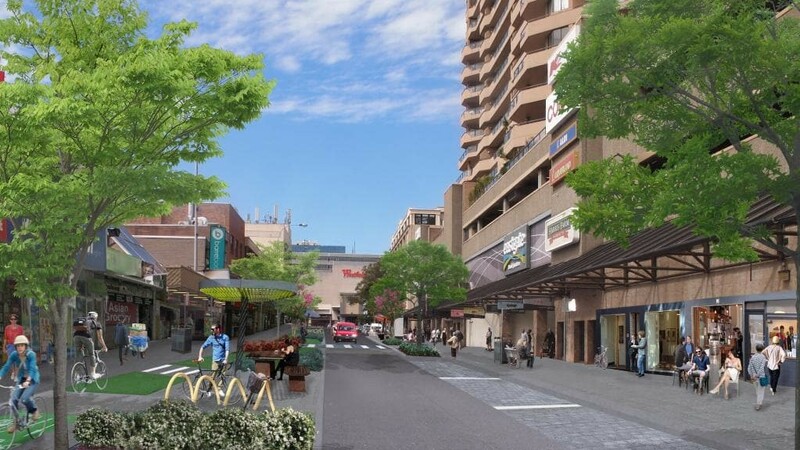 An artist’s impression of the Spring St cycleway at Bondi Junction. Business owners of Melbourne’s busy Lygon Street had the same fears several years ago when two high-demand parking spaces were converted to provide space for up to 24 bikes. Contrary to concerns, research evaluating the economic impact of shoppers who drive to Lygon Street compared with those who ride bikes showed that cycling generates 3.6 times more expenditure. The 2008 study found that while the average cyclist’s retail spending is only $16.20/hr compared to a car driver’s $27.00/hr, six bicycles can park in the space required for one car – therefore one car space equated to $27 per hour retail spending, while six bicycle spaces equate to $97.20 per hour. And it is not just the Melbourne hipsters swaying these statistics. There are countless examples from around the world where local business owners have over-estimated the impact of removing car parking spaces when developing their neighbourhoods. When traffic lanes were slimmed on Valencia Street to slow down cars and accommodate other modes of transport, 40 per cent of merchants reported increased sales, and more than 60 per cent reported an increase in customers on bicycles. When a protected bike lane was installed on 9th Ave, minimising parking, originally concerned retailers ultimately saw as much as 49% increase in sales, compared to a 3% increase throughout the wider neighbourhood. A multi-million dollar bicycle infrastructure investment in North Carolina has been more than justified by the $60 million annual revenue generated by tourists who come to the area specifically for bicycling. There have also been independent studies in both Toronto and London that show bike riders and pedestrians spend more on average in local shops than those who arrive by car. There is also evidence from Sydney and around the world that the construction of bike lanes has boosted commercial and residential property value. Though it is understandable for owners to be concerned about their business, precedent proves that they need not despair at the loss of car parking, as cities around the world awaken to the health, environmental and (evidently) economic benefits of moving away from car-centric city planning. Related: Bicycle Network's new reverse traffic pyramid – transport planning for a modern city.